F Adam Řehák (Medicine Hat, 2011-12) has signed for the rest of this season with Nice (France, Division 1). Last season, with Meran/Merano (Italy, Inter-National-League), he had seven goals and five assists in 12 games; he also had 29 points, including 11 goals, in 29 games with Cracovia Krakow (Poland, Ekstraliga). . . .
F Toni Rajala (Brandon, 2009-10) has been released by Yugra Khanty-Mansiysk (Russia, KHL) by mutual agreement. He had 13 points, three of them goals, in 21 games. . . .
G Barry Brust (Spokane, Calgary, 2000-04) signed a contract through the end of 2015-16 with Yugra Khanty-Mansiysk (Russia, KHL). Brust exercised an NHL opt-out clause to get released from Medveščak Zagreb (Croatia, KHL) last week. With Zagreb, he had a 2.15 GAA and a .933 save precentage in 19 games. . . .
D Shawn Belle (Regina, Tri-City, 2000-05) signed for the rest of this season with Düsseldorf (Germany, DEL). Last season, with Färjestad Karlstad (Sweden SHL), he had three goals and three assists in 39 games. . . .
D David Hájek (Spokane, 1998-99) signed a contract through Dec. 31 with Bad Nauheim (Germany, DEL2). The club has the option to extend the deal through the rest of the season. Last season, with Dresdner Eislöwen (Germany, DEL2), he had three goals and 22 assists in 42 games. . . .
F Justin Taylor (Medicine Hat, Red Deer, 1999-2001, 2003-04) has signed a contract through the end of this season with Mörrum (Sweden, Division 1). Last season, with Sterzing/Vipiteno (Italy, Serie A), he had three assists in six games. With apologies to Blackie Sherrod, we’re scattershooting on a Monday night, while watching the WHL and a touring pack of Russians play in Saskatoon. . . .
1. The Russians won the game, 3-2, but not before a shootout that lasted 11 rounds. . . . Daniel Nugent-Bowman of the Saskatoon StarPhoenix has a game story right here. 2. F Greg Chase, who is waiting for the Calgary Hitmen to trade him, played for the WHL against the Russians last night in Saskatoon. There is no truth to the rumour that Calgary GM Mike Moore was in Saskatoon trying to trade Chase to the Russians. 3. Is it true that the only way U.S. fans could watch last night’s Super Series game was to fork over $8 and watch via Neulion? All the while, of course, Canadian fans were watching on Sportsnet. You really have to wonder when the American franchises and their fans will start to be treated as equals by the WHL. 4. Attendance in Saskatoon last night was announced at 5,383. As of Monday afternoon, about 3,700 tickets had been sold for tonight’s Super Series game in Brandon. 5. D Austin Madaisky picked up five points in two weekend games and now is the AHL-Springfield Falcons’ leading scorer, with 10 points. Madaisky, 22, played in the WHL with the Kamloops Blazers and you’ve got to think he’s about due to get a look from the NHL’s Columbus Blue Jackets. 6. After a two-day break, the WHL schedule resumes tonight with the Kelowna Rockets in Spokane to meet the Chiefs. The Rockets will be without F Tyson Baillie and D Madison Bowey, both of whom played for the WHL against the Russians last night in Saskatoon. . . . The Subway Super Series continues tonight in Brandon. 7. The Rockets are the hottest thing since summer in the Okanagan. They are 17-1-1 overall and riding a 7-0-1 streak. 8. If you go by winning percentage, 14 of the WHL’s 22 teams are above .500 at this point in the season. . . . If you go by wins and losses, that number is at 11. 9. Unless I missed it, the WHL hasn’t acknowledged that there seem to have been issues with its website practically all season long. Do you think perhaps no one has told them? 10. Today is the 11th day of the 11th month, meaning it is the day we stop to remember our veterans and to thank those who continue to serve in our military and on our behalf all over the world. . . . If you haven’t already seen this right here, it’s a story I wrote about Hick Abbott, a giant of a man and a war hero after whom the since-retired Abbott Cup is named. . . . He also was among the 2014 inductees into the Saskatchewan Sports Hall of Fame in Regina. With two injured goaltenders healthy again, the Portland Winterhawks have returned G Michael Bullion to the NAHL’s Wenatchee, Wash., Wild. In four appearances with Portland, Bullion is 2-2-0/3.22/.900. . . . He joined the Winterhawks with Brendan Burke and Adin Hill both injured. They are healthy again, so the Winterhawks moved out Bullion and Bolton Pouliot, 20. Pouliot, who went from the Kamloops Blazers to Portland, was released last week. . . . The Kamloops Blazers might be without two veteran defencemen when they play host to the Spokane Chiefs on Friday. The Blazers had neither Josh Connolly nor Brady Gaudet in their lineup on Saturday when they lost 4-3 in OT to the Winterhawks in Portland. . . . Both defenders sat out with undisclosed injuries. . . . Kamloops will have F Jake Kryski, 16, back in its lineup as he has returned from the U-17 World Hockey Challenge. He’s got 11 points, including five goals, in 16 games. In Kryski’s last game, the Blazers beat the host Tri-City Americans, 2-0. Since then, the Blazers are 0-3-2. . . .
D Evan Wardley of the Seattle Thunderbirds is awaiting word from the WHL office on what will be his second suspension in less than a month. Wardley was hit with a seven-game suspension for a headshot major during a game against the Winterhawks in Portland on Oct. 11. On Saturday, Wardley was ejected from a game in Saskatoon with the Blades for a checking-from-behind incident. . . . The Thunderbirds are 1-1-0 on an East Division swing that continues Wednesday in Moose Jaw. . . . The Red Deer Rebels have released F Cole Chorney, 18, who is expected to play in the AJHL. Chorney, from Beaumont, Alta., had 11 points, including six goals, in 58 games with the Rebels last season. This season, he had one assist in six games as he had trouble getting into the lineup. . . .
G Zach Sawchenko has started each of the Moose Jaw Warriors’ past six games. He won’t make it seven. Sawchenko suffered an injury to his right leg late in the third period of a 4-2 loss to the Tigers in Medicine Hat on Saturday. . . . He is expected to be out for at least week. . . . G Justin Paulic is expected to start against the visiting Seattle Thunderbirds on Wednesday. . . .
On Sept. 23, the Calgary Hitmen traded F Pavel Padakin, a 20-year-old Ukrainian, to the Regina Pats for a third-round pick in the 2017 bantam draft. 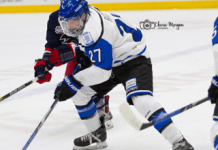 Last season, Padakin had 54 points, including 27 goals, in 66 games. . . . On Nov. 4, the Brandon Wheat Kings traded F Richard Nejezchleb, a 20-year-old Czech, to the Tri-City Americans for two third-round bantam draft picks, one in 2015 and the other in 2017. Last season, Nejezchleb had 57 points, including 32 goals, in 66 games. . . . Perhaps all of that explains why Brandon’s Kelly McCrimmon is the WHL’s best general manager. As a former WHL general manager once told me: “I wouldn’t buy a used car from him.” . . .
On the weekend, Cody Nickolet tweeted: “Mathew Barzal roaming around on crutches. Have heard the diagnosis of ‘a couple of weeks’ is very optimistic. Tough news if that’s true.” . . . Barzal was the No. 1 selection by the Seattle Thunderbirds in the WHL’s 2012 bantam draft. . . . If what Nickolet heard is correct, you have to wonder if Barzal will be back before Christmas. The Thunderbirds have four games left on an East Division tour that continues Wednesday in Moose Jaw. All told, Seattle has 15 games remaining before the 10-day Christmas break, with eight of those at home and eight of them inside the U.S. Division. . . . Barzal has 18 points, including seven goals, in 16 games. Last season, his first in the WHL, he had 54 points, 14 of them goals, in 59 games. . . . Meanwhile, the Thunderbirds should have D Shea Theodore, 19, back in their lineup on Wednesday in Moose Jaw. He was returned to them by the NHL’s Anaheim Ducks over the weekend. Theodore played five games with the Ducks’ AHL affiliate, the Norfolk Admirals, scoring three times and adding two assists. . . . He played for the WHL in the Super Series game last night in Saskatoon. . . .
Former WHL D Wil Tomchuk, 20, is back with the AJHL’s Fort McMurray Oil Barons. Tomchuk was released last week when the Prince George Cougars acquired G Jared Rathjen, 20, from the Medicine Hat Tigers. . . . The Oil Barons were at the maximum of six 20-year-olds and to make room for Tomchuk they dealt G Jesse Gordichuk to the Olds Grizzlys. Gordichuk had requested a trade — see, it doesn’t only happen in the WHL! . . . Tomchuk played with the Oil Barons in 2011-12 before moving on to the Tri-City Americans and then to Prince George. . . . Things got a bit heated late in an NCAA hockey game between Cornell and Quinnipiac on Saturday. Yes, some bad words were spoken. We don’t see this kind of thing in the WHL these days, not even in the interests of trying to sell tickets. Too bad! . . . Chris Dilks has more right here. (This one comes with a language warning!) . . . Later on Monday, Cornell head coach Mike Schafter issued an apology; he also drew a one-game suspension from the ECAC.